Ever wonder where it was that St. Symeon sat on atop a pillar for all those years…? 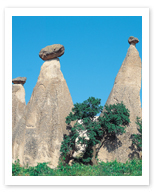 Also known as the “Valley of the Hermits”, this veritable orchard of fairy chimneys was once favored by some very solitary monks, as the name suggests. One of them, St. Symeon Stylites, a Byzantine saint, gained his fame by sitting atop one of these three-story pillars for 37 long years before deciding to move on. If you like, perch yourself atop one of the more manageable pillars, or a stool for that matter, and see if anyone offers to bring you lunch. If not, we recommend that you move on. The average Joe is just not suited for hermitry. But this is where the all-star pillar sitters came, so it may be worth a try- at least for a little while.